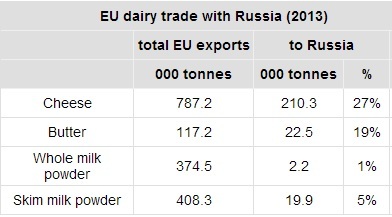 Russia is a key export destination for EU cheese and butter, taking in around 27% and 19% respectively of the total volume of EU exports in 2013. According to DairyCo, in the short term, the loss of this export market will create a significant increase in available stocks, which will put some pressure on the market. It says unless Russian consumer purchasing patterns change significantly, the supply gap created by the ban should be filled by other exporting countries, creating market opportunities elsewhere. Although the EU is also an important supplier of SMP to Russia, it does not represent one of its key export destinations, and the price impact on this segment of the market is not expected to be as significant. According to ICOS, in its latest dairy market update the generally poor sentiment that has re-emerged in dairy markets of late looks like being exacerbated by Russia’s announcement of it’s intention to block EU dairy imports. It says the most recent GDT price for whole milk powder, of $2,725, puts milk in the 20c/L ballpark, and while that price level is almost certainly unsustainable for even the most efficient Kiwi producers, and should be subject to a rebound, it does suggest that the market position for the immediate future will not be positive. Buyers seem to be intent on sitting back in expectation of further price weakness, prompted by strong supply numbers from Europe, the US and New Zealand, and by expected weaker demand from China, given the reports of significant volumes of stock overhanging the market there. ICOS notes that market optimists point to ongoing general demand strength across key markets, coupled with the expectation that moderating prices will improve affordability and prompt buying in developing markets. It also reminds us that we are going through an unprecedented period of almost 5% supply growth, and that it is improbable that supplies would continue to grow at such a pace. The optimists also highlight that the Russians will also need to keep sourcing supplies of cheese and butter elsewhere, thereby eating into someone elses stocks. Also, our great rivals in exports, the US, are coming off a milk price base of $21.60 per 100lbs, or around 37c/L. This means that they won’t be in a position to quickly join the race to the bottom in export markets. Meanwhile the current Eurex index values European at around 33c/L. However ICOS says the pessimists suggest that the reduced presence of Russia and China in the market will prompt all other buyers to hold back and watch prices drop still further. The crucial issue will be the degree to which European and US supplies respond to weaker prices. Irish and many European suppliers will also have superlevy concerns, but cheap concentrates, good weather, and lots of quality forage may keep the milk flowing.